designer art, clothing, jewelry, and plenty of fun and interesting things. on Tehama Street this year. 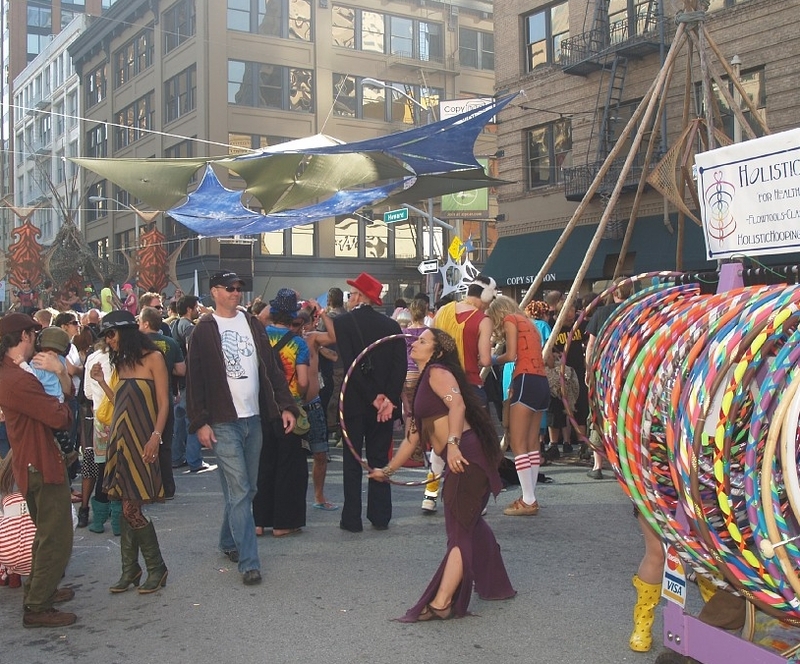 There will be 2 foodcourts at the How Weird Street Faire this year. You’ll find tasty food and beverages there, to sustain you during our trip through outer space. There will also be 5 bars throughout the faire, with beer, wine, sake, and non-alcoholic drinks. Save money with the Magic Sticker! The Mos Eisley Foodcourt will be on Howard Street, between 2nd and New Montgomery. There will be a Cantina Bar and several Cantina Cafes. Come and enjoy fine food, near the main entrance to the faire. Be entertained by dancers from around the world on The Cosmic Dance Stage, next to the center intersection. The Foodcourt at the End of the Universe will be on Howard Street by 1st Street. There will be several food trucks offering a wide range of options. Enjoy the epic scenery, and the galactic-class music and dancing of Uranus (the Super Stage of Bass) and Terminal 540. And don’t worry, no matter how many times you go there, you will never have the awkward experience of running into another you. Every vendor at the faire will be offering Magic Sticker specials. for more magic and more fun! and many free things, plus they help keep the faire going! Click here to see all of the Magic Sticker specials. This year will have fewer vendors, so apply early before we fill up. Save money and secure your place at the faire with early bird vending applications, due by March 12, 2014. If there are still spaces left, regular vending applications will be accepted until the faire.